Add pearlescent shimmer to any paper craft or mixed media project. Mica Sprays adhere to most non-porous surfaces like paper, canvas, wood and fabric. Use them as a finishing spray or layered over inks and paints. Each set contains three 1 oz. sprayer bottles. Tim has chosen Brushed Pewter, Antiqued Bronze, and Tarnished Brass as his featured colors in this set. 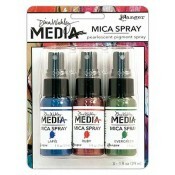 These Mica Sprays are chosen to coordinate with Tim's color palette.